Looking solely at the dates, the Knabenchor Hannover is still young in comparison to the other famous boys’ choirs such as the Dresdner Kreuzchor, the Thomanerchor Leipzig or the Regensburger Domspatzen. Its foundation in 1950 continued a Hannoverian choral tradition going back as far as to the “chorus symphonicus” of the 13th century, which was responsible for the choral services in Hannover’s main churches. Without an affiliated boarding school, choral works from all eras are rehearsed on a daily basis. The final result are excellent concerts in historically informed performance practice. The associated singing school provides over 200 boys per year with an exceptional education, widely exceeding the musical aspects and enabling each of them to discover their own potential. The Knabenchor Hannover is an independent organisation which is not owned by public or ecclesial institutions. As a distinguished ensemble, first-rate musical partner and respected musical ambassador, the choir under direction of Prof Jörg Breiding is an important part of musical life in Lower Saxony and well-known far beyond. 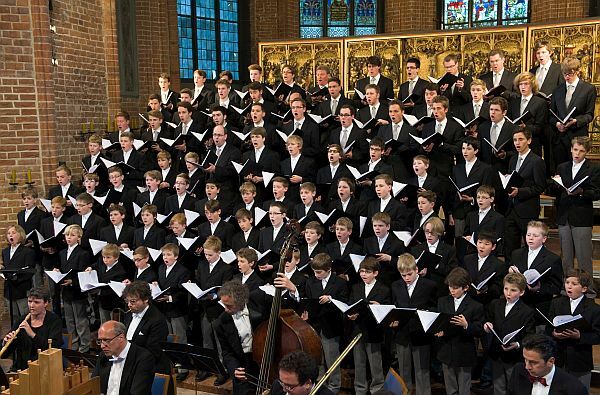 The Knabenchor Hannover is, and has been for decades, one of the outstanding choirs of its kind, at the same time continuing an old choral tradition in Hannover which goes back to the boys’ choir of the late Gothic Marktkirche. In 2002, Prof Jörg Breiding took over the job of the conductor from his predecessor Heinz Hennig, who had founded the choir in 1950. The extensive repertoire of the Knabenchor Hannover ranges from works in Venetian polychoral style to contemporary compositions, focusing on compositions from the 17th and 18th century, most importantly the works of Heinrich Schütz and Johann Sebastian Bach. Concerts with renowned musical partners in Germany and abroad, guest performances in major concert halls and at major music festivals as well as award-winning CD recordings belong to the choir’s activities. Since its foundation, the choir has been on tour over 80 times in more than 45 countries, visiting almost all countries of Europe, Russia, Israel, Japan, Cuba, Central and South America, the USA, South Africa and China.